A favourite in Smt. Subbulakshmi’s home, Aviyal is a healthy, practical and tasty side-dishes popular in the Tamilnadu and Kerala states of South India. Simple to cook and festive in taste, this can be prepared whenever one has an assortment of vegetables. Her favourite combination is cucumber, drumstick, carrot, pumpkin and chayote (chow-chow). Apart from these, yam, potato, raw mango, snake gourd and ash gourd are other preferences. Except mushy vegetables and tomatoes, most other vegetables can be used depending on availability and taste. I was a little surprised to see tamarind paste instead of yogurt in Aviyal, but as Smt. Subbulakshmi’s explained, many traditional families add tamarind so that the dish stays fresh for longer hours. 1. Grind the ingredients for the paste into a thick puree. 2. Wash and chop all the vegetables, drizzle 1 tsp oil, add the turmeric powder and cook until tender using very little water on medium heat. You can pressure-cook for upto 1 whistle. 3. Add the tamarind paste and allow to simmer for 5 minutes. Add 1-2 tablespoons of water if required. 4. Add the coconut paste and allow to simmer for a couple of minutes. 5. In a small pan, heat the oil and add the curry leaves. Pour it on the aviyal. Serve with steamed rice. Also makes a sumptuous combination with dosai, rotis and pooris. In Smt. 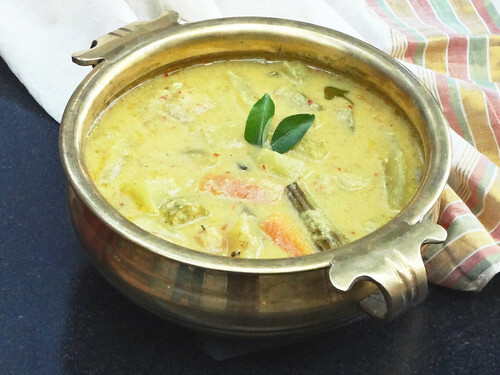 Subbulakshmi’s house, the thick gravy is eaten with rice while the vegetables are treated as the side-dish. This recipe was first published in The Great Granny Diaries – a column in Harmony Magazine. Part-1 of this post is the interview with Subbulakshmi, a great-granny from Chennai.